Do you wish you had a superhero standing by to guard your cubicle from pesky coworkers? Perhaps you could just use a superhero’s cape. That’s what the CoworkerBGone cubicle door looked like. 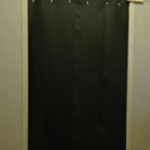 The “Eco-fi” cape was basically a rod with a piece of black fabric hanging from it and a bracket to attach the hinged rod to a cubicle wall. The plain black curtain was made of recycled bottles. But you could also choose more decorative curtains made from the fleecy polyester material popular for blankets and pajamas. What Happened With This Idea? What’s odd is that at least three competitors with similar products also appear to be out of business as well. Good luck finding a supplier for the Dilbert Inflatable Door, Cube-a-Door and CubeDoor these days. Fortunately, you can still find higher quality workstation privacy screens online. Quartet can come swooping to your rescue with a standalone mobile screen to block off your cubicle while still letting the light in. The aptly named “Behind-You” screen from Teknion is another high end option. Apparently, companies don’t have a problem with granting workers more privacy. They just want a product that looks professional and is constructed of quality materials.